This got me thinking about connections and just how little you can do for yourself at work! Large organizations are divided up into Units, Divisions, and Functions. There are rules, procedures and policies that are created to ‘control’ what individuals can or can not do for themselves. Simple things like moving your desk – no you can’t do that, it might cause a health and safety issue, you need to contact facilities, make a formal request, wait a couple of days. Arranging travel – need to use the official travel tool, fly on the preferred airlines, and stay in the chosen hotels even if these on an individual travel basis maybe more expensive. Bring your consumer device (phone/tablet) to the office, installing some software – we don’t support that, it creates a security issue, whatever. Large organizations can run like well-oiled machines, the inner workings need to stick to the role within predefined tolerances, doing just their job, no more, no less. The machine needs to be lubricated with large amounts of trust to ensure the parts work together without causing too much friction….if the world remains fairly constant this machine like approach will deliver scale and efficiency. But it is extremely difficult to change large and highly complex machines. The machine appears to be working, so if it isn’t broken don’t fix it. Or perhaps there is a fear of changing any one part or component, as this may cause unforeseen friction with at least the adjacent parts, and potentially extending to the whole ‘value chain’, and possibly leading to fatigue and ultimately failure (at least of parts or components) as the level of trust diminishes. Unlike my phone it is far from obvious in large organizations when the component parts are not working together, when the signals are not at full strength. Of course ultimately these weak or no existent connections between the parts of an organization will show up in the products and services, the customer will experience them, and then ultimately they will be reflected on the dashboards of the financial results. How many bent connectors are there in your organization? Time for some DIY ? I can’t tell you how many meetings I have been in where most if not all participants have their laptops open and are actively using them. At best (just sometimes) people are recording notes, at worst they are physically (or virtually) present but mentally and electronically somewhere else; in their email, Facebook, twitter or who knows where on-line space. They are certainly not giving the meeting or other participants their full attention. Even for those with the best intentions (taking notes), there is that irresistible temptation to hastily read an incoming email, respond to an instant message, or even perhaps adjust a presentation they are about to make. And of course it is not just Laptops, its tablets, and smartphones. When you ask someone who hasn’t been paying attention for their opinion, or a question, all too often you need to repeat the point, repeat a summary (which may not be a bad thing), or just simply move on without their input. What impact does this have on the quality of a meeting? I feel for the person presenting or sharing in such circumstances, I’m sure they sense the lack of attention, I wonder why they continue without challenging the participants, perhaps the participants are more senior, perhaps they don’t want too much attention in the first place, or perhaps they don’t want to call out the very behaviour they exhibit themselves. Once they have completed their presentation, answered one or two questions they can mentally leave the meeting and return to their inbox. I’m old enough to remember meetings before Laptops/tablets/smartphones – smoking in meetings was still allowed! I’m sure in those meetings people didn’t always give their full attention either, perhaps thinking about the next meeting, their presentation, what to cook for dinner, the weekend, whatever, but apart from the occasional yellow sticky being passed, participants were not being continuously interrupted and being taken mentally out of the meeting. Meetings were a time when you interacted, had a dialog with people at the same time (physically or virtually), not with the rest of the world! For me it comes down to the purpose, value and importance of the outcome of a meeting. If there really isn’t any, people instinctively know this; people may as well spend the time mentally absent or even better physically. I remember my first blog post on an internal blogging platform several years ago now; As I started to write I sat there thinking to myself do I actually considered this writting of a blog post to be work; it was during normal office hours, I was in the office, I was sitting at a desk, using a company laptop, I was being paid a salary. To someone passing by it would appear that I was doing ‘work’, but was my writting a blog post actually ‘work’ ? If it was ‘work’, what value would it contibute, how would it be measured ? What was the point ? Who anyway was going to read it ? One thing that crossed my mind at the time – would my manager consider it to be work ? (that is assuming my manager would know about it) Valuable work ?? And just how would it be taken in to account during my annual performance review ??? After a few minutes, I pressed on, helped by a couple of additional thoughts: How many hours a day did I sit at my desk, looking like I was working ? And how many emails per day I would read, forward, respond to, file, delete, without ever considering if this activity was adding any value, and not questioning if it was work or not. I took it for granted that email was work, but questioned blogging. 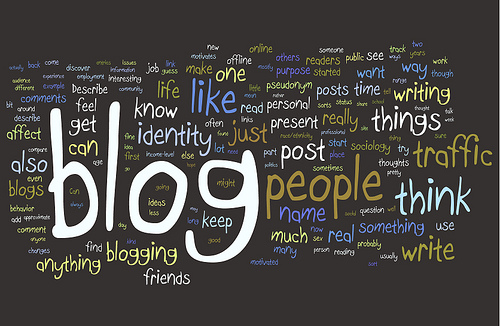 To me blogging is the act of sharing our thoughts and opinions openly. While I don’t have an answer for how to measure the productivity impact, I do believe it adds value to those who write, those who comment, to those that read, and to the organization overall, not least in that it shares knowledge accross oragaizational silos, geographies, and time zones. People within an organization can choose to follow blogs (it is subscriber based) that they find of value, unlike email (publisher based) where you are either on the distribution list or not, so it is exclusive, and your inbox is filled with emails that are of no value, yet we don’t question if this is work. And just for the record, I’m not writting this at work !